What is cedar and why is it a good choice of material for your roof? It is one of the most common materials in roofing and it is used for both commercial and residential buildings alike. It is this versatility that makes cedar roofing such an excellent choice of material when you consider the finishing touches on your home and the overall look you hope to achieve. There are two types of cedar wood used for roofing, red and white. Red cedar is the preferred material because of its durability and it is often the most common material used during roofing projects; however, it is the costlier material of the two because of its premium quality. When considering the protection of your home red cedar contains a natural preservative called tannic acid which helps it remain naturally resistant to rot and decay. The strength and durability of red cedar also helps protect your home from unrelenting elements such as strong winds or heavy rains. White cedar is a cheaper alternative with only certain kinds of white cedar, such as Eastern or Northern, being resistant to rot and decay. Aesthetically, the wood has a cinnamon and honey like appearance that will eventually mature into a silverish hue over time. Choosing between shingles or shakes will ultimately come down to the overall look you are trying to achieve for your home. Shingles are sawn from woodblocks and can either be sawn or sanded. Shingles have an overall refined look with a consistent appearance, thickness, and width. Sawn cedar shingles have the rugged appearance of cedar shakes but still maintain a tailored appearance whereas sanded cedar shingles are smoothed on both sides to create an even more refined look. Cedar shakes are best for those who wish to maintain a rustic and rugged look. They are split from woodblocks and are less uniform in appearance, thickness, and width than shingles. Shakes can either be hand split or tapersawn. Hand splitting cedar shakes will create that rough textured appearance ideal for achieving that rustic effect. Tapersawn shakes are sawn on both sides and still maintain the thickness and durability of a shake while still achieving more of the tailored look of a shingle without sacrificing its ruggedness. Apart from the material’s aesthetic values and supreme durability there are also other benefits that make this one of the top choices for roofing. Cedar wood contains natural preservatives that protects your home from the elements and prevent decay from moisture and insect damage. 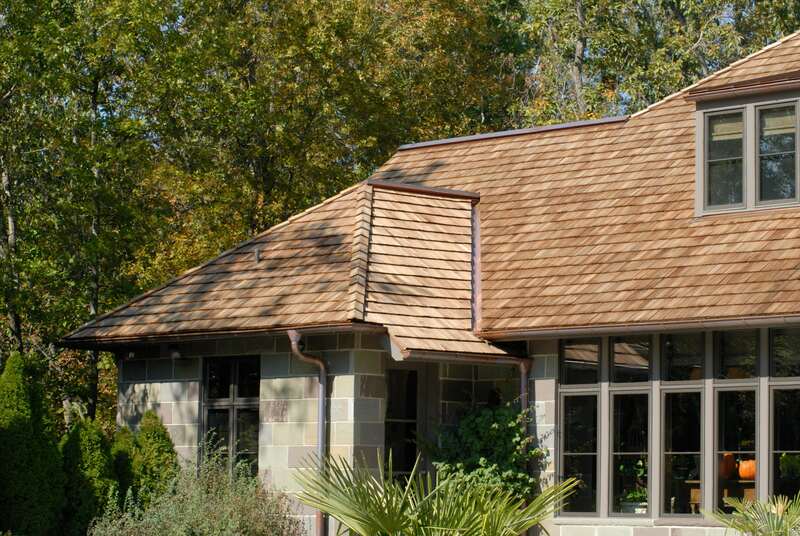 A variety of finishes may also be applied to cedar roofing, from oils to stains or solid coatings and paint. It also has exceptional thermal insulation qualities and will help retain and prevent temperatures from penetrating or escaping the home. This means a warmer winter and a cooler summer along with the opportunity for money to be saved on reduced energy bills as a result of this better insulation.